Last night I attended a cool event at Baagan, one of my favorite local high-raw vegan restaurants where I’m obsessed their salad trio. 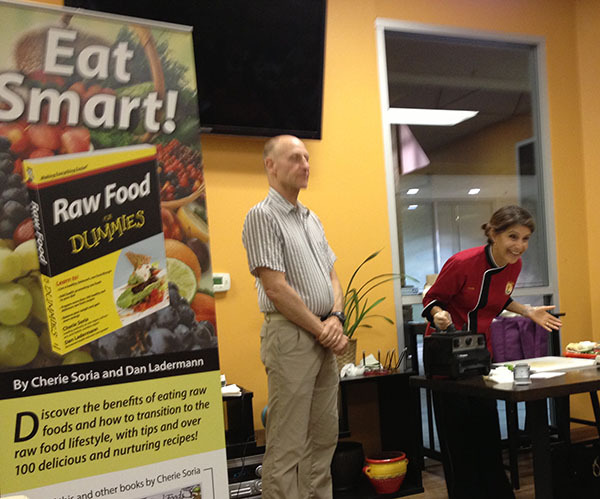 Cherie Soria and Dan Ladermann of the Living Light Institute stopped by to promote their new book, Raw Food for Dummies. Of course I had to grab a copy to add to my collection. 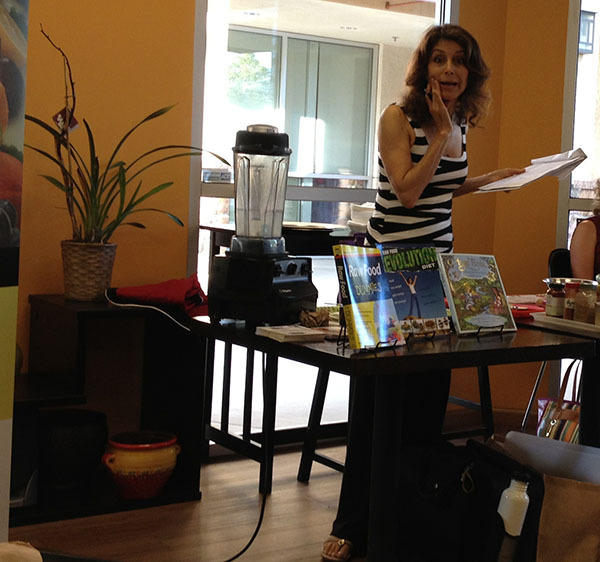 I’ve seen Cherie Soria before, a couple of times actually at the 2010 Raw Health Expo and the 2011 Raw Health Expo. And we stopped by the Living Light Institute on a road trip to Fort Bragg awhile back. But it was very inspiring to see her and her husband, Dan Ladermann, discuss their new book and high-raw life style in a smaller intimate setting. The event lasted over 2 hours and was very engaging, I thoroughly enjoyed listening to both Cherie and Dan discuss their lifestyles, the process of writing the book, and starting Living Light Institute even though I’ve heard some of it before, it was re-motivating for my own lifestyle and I learned more about their personal journeys to a plant based diet. Cherie is now 66-years-old and does not look it at all. She’s inspiring to me for being so active and passionate about life, travel, career, etc. at that age. I could literally write pages and pages from the notes I took last night, instead I’ll bullet point the highlights. Cherie is not 100% raw vegan, but she’s 100% healthy as she puts it opting for whole, nutrient-loaded foods over processed foods. She stressed a plate of steamed vegetables are healthier than a raw cashew cake. She and Dan described desserts, even raw vegan desserts, as a recreational drug to be enjoyed in moderation which is a perfect way of looking at it for me since our bodies do not crave sweets for nutritional value. 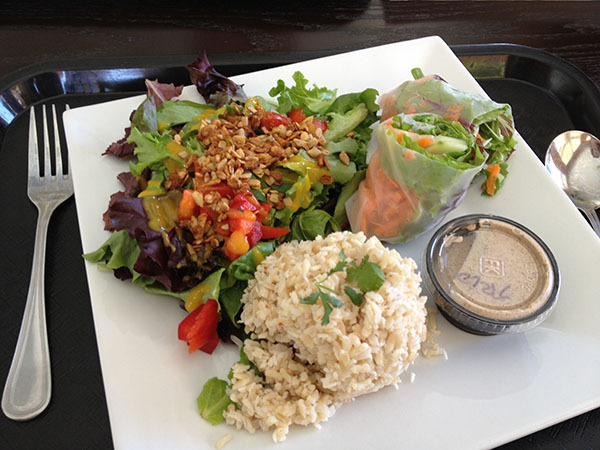 A high raw diet is about giving the body the nutrient-dense fuel it needs. Cherie’s list of foods to avoid included fried foods, processed foods with oil like tortilla chips and crackers, refined sugars like found in processed foods and desserts, artificial sweeteners citing emerging health studies for cancers and migraines, and gluten also citing emerging studies for it fueling inflammation in the body and allergies for everyone and obviously is not fun for those with celiac disease. Cherie again stressed not eating late in the evening before bed recommending cutting off the calories at least 3 hours before sleep to give the body plenty of time to digest so it doesn’t interfere with sleep. She also recommended not having sweet foods late in the day, like raw desserts or a lot of fruit, because it can be too stimulating also interfering with sleep. And she recommended cutting down on oil as much as possible getting good fats from avocados, seeds, and nuts instead. 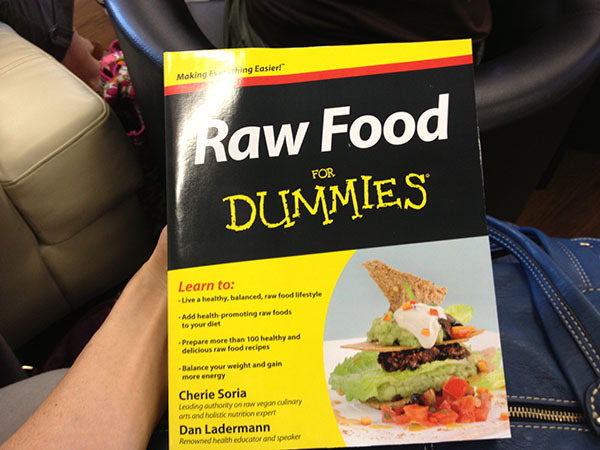 The goal of this new book is teaching a high raw vegan lifestyle that’s simpler and faster for busy and smart people as Cherie put it, making it seem less overwhelming and putting emphasis on the point that it can save a lot more time down the road having more energy, sleeping better, and not being sick. Steaming veggies more instead of stir frying them. Being a little more selective when eating out and not being afraid to make special requests. Reducing the amount of bread and chips in my diet. Working more with whole fats in my recipes. Here is a longish video of Cherie and Dan promoting the book from AtGoogleTalks. That plate of food looks ridiculously delicious! What a fun event to attend! WOW! I sure wish I had these events in my area!Looks fun and informative!